How important is water in cartonboard production? Water is an essential element for paper and board production. Water acts as a bond between the fibres and in the production process, is needed for transporting, cleaning, lubrication, carrying energy in the form of steam and is used in cooling process units. Water is usually taken from a nearby surface source such as a lake or river. 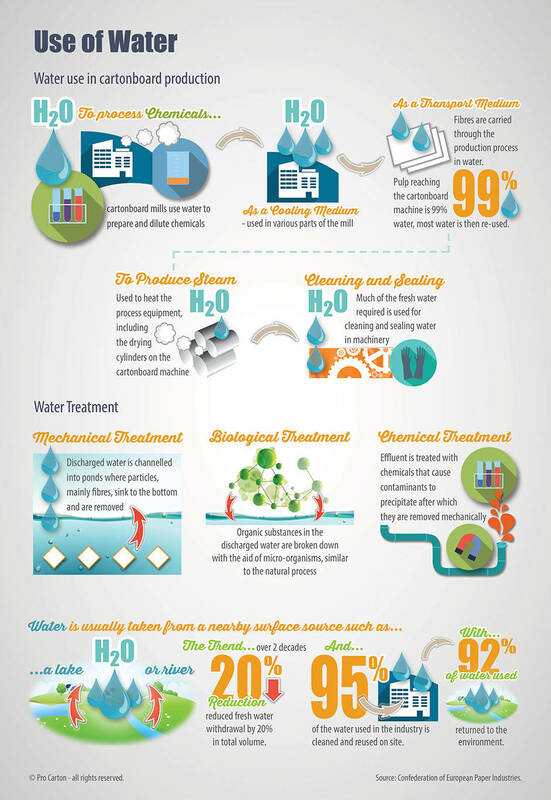 95% of the water used in the industry is cleaned and reused on site. All waste water is purified at the mill in accordance with European regulations and standards, before being returned to the environment. Mills are working to reduce process water use as this makes good economic as well as environmental sense. The trend over the past two decades has been to reduce fresh water withdrawal by 20% of total volume.